Learn how to create email templates to easily construct messages for a consistent look within campaigns. You can build email templates in the Listrak application to be used over and over again to create messages for your campaigns. Templates come in handy for a number of reasons. The template creates a subtle familiarity and consistency for your customers. They develop an expectation for what your campaign emails will look like. Of course, that doesn't mean that your creative and messaging becomes dull; it simply means that the key components you've chosen to brand your emails with remain in place and consistent. Another benefit of creating and using templates is that it drastically cuts down development time. Templates are not "list-centric," so whatever you build will be available across all lists on your account. You must have Admin-level access to create, modify, and access templates. Learn more about Listrak's permissions here. What type of template should you build? It really varies based on your needs. Templates can be designed to suit their campaign and use. So, for example, your weekly newsletter, daily deals, and branding emails might all have different looks, but each might use a template. Another way to approach templates is to create different styles or looks that aren't specific to campaigns, but are variations of the way you want to display images and content. For example, one template may be compromised of mostly images, while another could be a more balanced mix of written content and pictures. If you're looking for a more complex template, Listrak Professional Services can create any number of custom templates designed specifically for your needs. Just ask your account manager for more info. NOTE: Users with admin access are able to reach this page. If you are not an admin user, please contact the main user on your account to provide that access, if applicable. 2. Go to Content & Media. 3. Then Templates. All of your templates will be listed here after you've created them. 4. Scroll to the bottom of the page and click Create New Template. 5. Enter a Template Name. 6. Using the checkbox, select whether or not you'd like the template to be a Locked Template. Read more about locked templates below. 7. Design the email template, including graphics, logos, and other media as necessary. 8. Assign user access for the template to individual users. You can Select All to give open access to the template. NOTE: The account owner is selected by default. If that is not you, be sure to add yourself. 9. When you're satisfied with your layout, click Save. Now you can access the template anytime via Authoring > Content & Media > Templates. System administrators may lock specific sections of HTML templates, only allowing other users to edit the content in specified areas. This gives you control over how much content users are able to modify. When users author a message using a locked template, all of the locked areas are grayed-out while and only the editable area remains live. An understanding of HTML is very helpful when using the locked template feature. Using the HTML Editor, define the editable area by placing [[EC]] in the HTML code where you would like for the editable area to begin, and [[/EC]] where you would like it to end. The opening and closing EC tags (which stands for editable content) should be inserted between the opening and closing TD tags. The WYSIWYG Editor view will show the EC tags, which are highlighted in yellow in the below example. 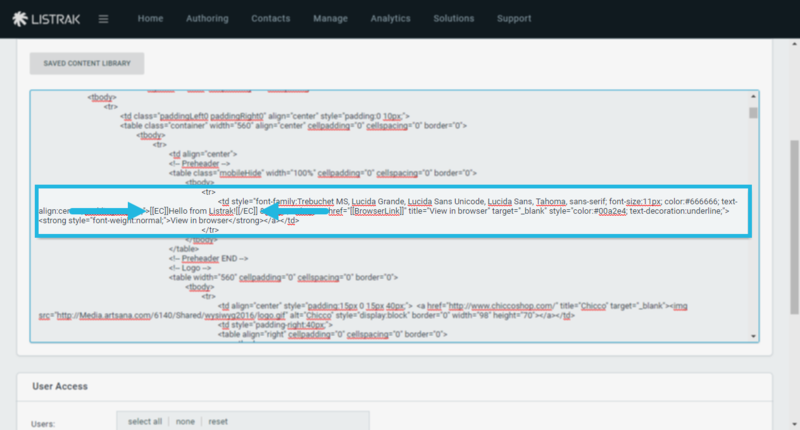 This area will be the only editable area when a user opens the template on the Authoring page. You can also designate editable content using the Editable Content button on the WYSIWYG menu bar, however, you have more control using HTML. NOTE: Editable content areas need to be in all caps.